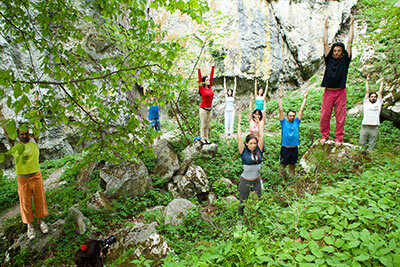 Every spring, at the turn of April and May, members of all the yoga schools of ATMAN federation have the wonderful opportunity to meet and enjoy the spring holiday camp in Romania. The camp takes place in Baile Herculane – a little town situated in the south-west part of the country – which is well known for its rejuvenating hot springs and magnificent nature. The camp lasts twelve days and offers a great variety of spiritual activities. You are invited to live unique moments with your friends and thousands of yogis from all over the world. Participants in the camp can choose from a great variety of spiritual sessions, including meditations in yang spiral, spiritual exemplifications, meditations on godly hypostases, special seminars for men and for women dedicated to the awakening of the state of Vira or Shakti, lectures on different topics, theater performances, yoga practice in the nature, and many other activities. You can choose what suits you best and what interests you most. To participate in these events, you don’t need to be a highly experienced yoga or meditation practitioner. There are indeed some activities only accessible to the ones with special initiations from other camps or higher years of the Yoga class, but most of the activities are not requiring any special preparation or knowledge. Your interest and openness are enough to enjoy the various benefits of all the offered spiritual events. The lectures are held in Romanian, but for all the main activities, English translation is provided. In most cases, also many other languages are available, such as German, French, Italian, Spanish, Hungarian, Russian or Czech. There is something much more special about this camp than just the spiritual program embedded in the surrounding beauty of nature. Due to the participation of thousands of Yogis and the subtle support, the camp has a very strong energetic field. It makes you feel uplifted, happy, and sublime. It can also speed up your inner transformation processes considerably. It can even feel that after several days in this camp, you collected experiences compared to several years of individual yoga practice. Often solutions for problems of the day-to-day life appear, solutions outside the scope of our daily mind-based approaches. These are only some of the manifestations of the strong spiritual field of this camp that is offered to all participants equally. Every year arrive thousands of Yogis, mainly from Romania, but many also from European countries and even from overseas. All of them share their experiences, their stories, their lives, and this creates the very pleasant atmosphere of international friendship and spiritual unity. A very beautiful moment of such international brotherhood is the meditation in yang spiral for communion with the souls of all nations who are present in the camp. Each nation, just like us, has its collective soul, which is endowed with special qualities. Through this special meditation, it becomes easily possible to feel these nuanced qualities and the inherent life-force of the different cultures. They become perceivable, nearly touchable, and all participants can share it and get to know it. During the camp, you can notice that something very beautiful starts to open within you, which resembles the surrounding beauties of nature. Day by day you get closer and closer to your heart and to your soul, diving deep into your most inner self. Then you can feel that you have entered in some secret earthly paradise. However, gradually you will discover that being in paradise is not a matter of outer conditions. Instead, it depends on our inner attitude and on our way of perceiving the world around us. In this camp you can very easily find the paradise within you. I want to go to the camp – what will I need? To Herculane you can get by bus, by train, or by car. Herculane has both a bus stop for international lines and train station. The town lies on the main railway line and on the main car route, too. Ask your teacher about the travel options, he can help you finding your best way and often the yoga students travel together. The accommodation is quite easy to find, however its quality differs, and so does its price. You can stay in a hotel, or in private house, or you could even place your tent on the Plateau meadow if you are on a very low budget and don’t mind about a small adventure. It is helpful to organize your accommodation beforehand, ask your teacher about possibilities. There are shops in the town where you can buy food and clothes and all you need for your daily activities. There are several restaurants where you can have lunch or dinner. And you can enjoy the specialty of this town – open market every day where the locals sell their home-grown vegetables, fruits, home-made cakes, chocolates, biscuits, cheese, butter, and many other delicacies. You will certainly find it useful to have something to sit and practice on: a yoga mat, a blanket, a special pillow or a camp-chair. The inside locations offer chairs, but sometimes the halls have to host more participants than seats are available, which for yogis is not a problem, but in those cases it is useful to bring an isoprene to sit on. For the outside activities, mainly the yang spiral meditations that last into the late evening, it is good to have some warm clothes with you. The weather can be very beautiful, hot and sunny as in pure summer, but also still very April-like rainy days and cold nights. Be prepared and have a raincoat in your bag. In addition, a good pair of shoes has proven useful, after all the location lies in the Carpathian Mountains. Romania is still an inexpensive country, and the nearly two weeks of camp including fee, accommodation and food will hardly exceed the average price of many weekend seminars. There are cash dispensers in town, where you can withdraw lei, the Romanian currency, directly from your bank account. In addition there are also exchange offices available to exchange your cash. The shopkeepers and property owners usually understand and speak at least a little English. But definitely you can take with you a Romanian dictionary to help you in uncommon situations. Anyhow, if it is your first camp, your more experienced colleagues will always be there to help you. Most of the organizing team of the camp speaks English quite well and you can communicate with them easily. At the beginning of the camp you have to go to the “Comandament”, the organizational office where you will get your camp ID which you need to bring to the program. Your yoga instructor will tell you what you need to bring with you to sign in for the camp. The participants of the camp need to follow certain rules for the camp to be harmonious. You will find these rules in the special booklet that you will be given after you receive the camp ID. The booklet also includes the program of the camp for every day. Members of the organizing team will gladly help you or advise you when you ask them. In your free time you can do many things as visiting the historical part of town, a spa or the open hot springs, or you can make a trip and admire the beautiful mountain landscape and its fairylike nature. Herculane is situated in the romantic valley of river Cerna, near the borders of the Romanian national park Domogled.